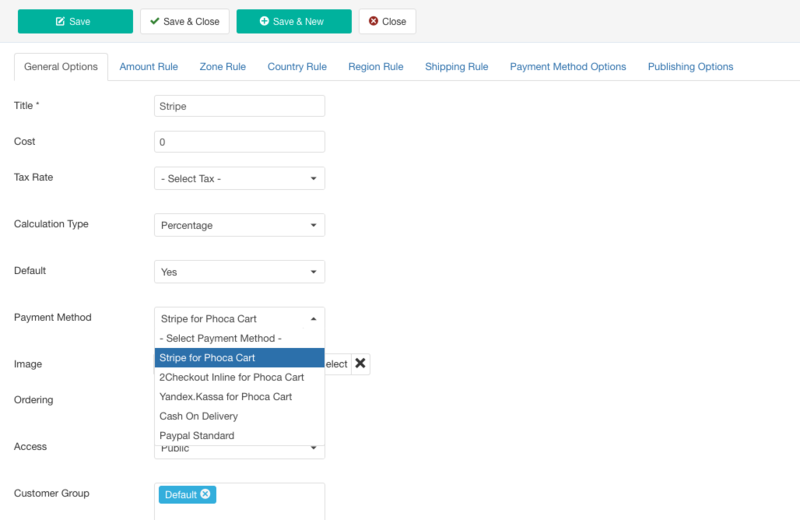 This plugin provides integration of Stripe the processing and payment service to Phoca Cart - e-commerce extension for Joomla. Using Stripe your business can accept all major debit and credit cards from customers in every country in 135+ currencies. More details can be found at product page. SSL certificate is highly recommended to use to ensure card details of your customers are safe. Sign in to Stripe dashboard and proceed to Developers > API keys. You need API keys for live and test environment. These keys should be added to Phoca cart payment method settings. Now it is time to set up Webhooks. Proceed to Stripe Dashboarc > Developers > Webhooks, then click on Add Endpoint button. URL to be called: the URL can be taken from Phoca Cart payment method settings. Read more. Webhook version: set the latest version. Filter event: set Send all event types. Find Click to reveal button and copy the Webhook Secret for further usage in Phoca Cart payment method. Stripe for Phoca Cart can be installed as a typical Joomla extension. Make sure you have downloaded the latest version of the plugin. Proceed to Administrator panel > Extensions > Manage > Install and select the package downloaded from NorrNext site.Then go to plugins and enable Stripe for Phoca Cart plugin. There are several tabs with settings. Let's look on each tab. The following tab is related to the selected Stripe method, so you must fill it correctly. Sandbox Mode - If Sandbox Mode is enabled, no real money are transfered. Sandbox is used to test the payments. Payment Failed - Select the order status that will be applied based on failed payment or error during transaction processing. By default it is Cancelled. Payment Cancelled - Select the order status that will be applied based on cancelled payment or error during transaction processing. By default it is Cancelled. Publishable Key - Set your Publishable Key. You can find it in Stripe Dashboard > Developers > API keys. Secret Key - Set your Secret Key. You can find it in Stripe Dashboard > Developers > API keys. Webhook Secret - Set your Webhook Signing Secret. You can find it in Stripe Dashboard > Developers > Webhooks. Where is mydomain.com - set up your domain and make sure you have a valid SSL certificate. You need to copy this URL and paste it in Stripe dashboard > Webhooks. Note: API keys are required fields to save the configuration. Fill them if even you are going to use sandbox mode. Publishable Key - Set your test Publishable Key. You can find it in Stripe Dashboard. Secret Key - Set your test Secret Key. You can find it in Stripe Dashboard. This feature allow to get an update of the plugin via back-end in few clicks. Set your download key to enable the update using Joomla! Update System. You can find the key in your Stripe for Phoca Cart subscription on the NorrNext website. Make sure the plugin is enabled! Does your plugin support 3D Secure? Yes, 3D Secure is implemented automatically if it is provided by the bank which has issued the debit/credit card. 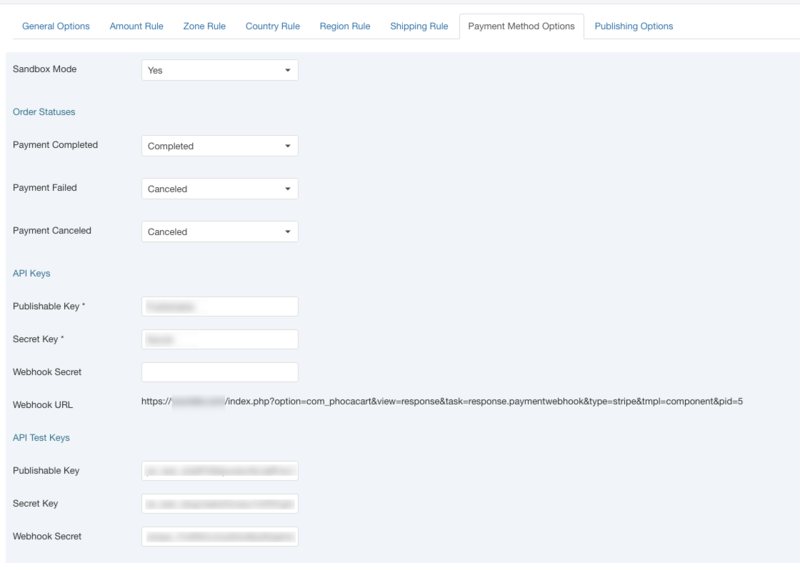 The payment is successful in Phoca Cart, but it has pending status in Stripe dashboard. You missed Webhooks settings. Please, get Webhook URL and add it to Stripe settings. How can I test payments? Enable Sandbox mode, add test API keys and use Test card numbers and tokens or Testing 3D Secure payments. Stripe accept payments in iDEAL and other payment methods. How I can add them? You can activate required payment methods from Stripe Dashboard.